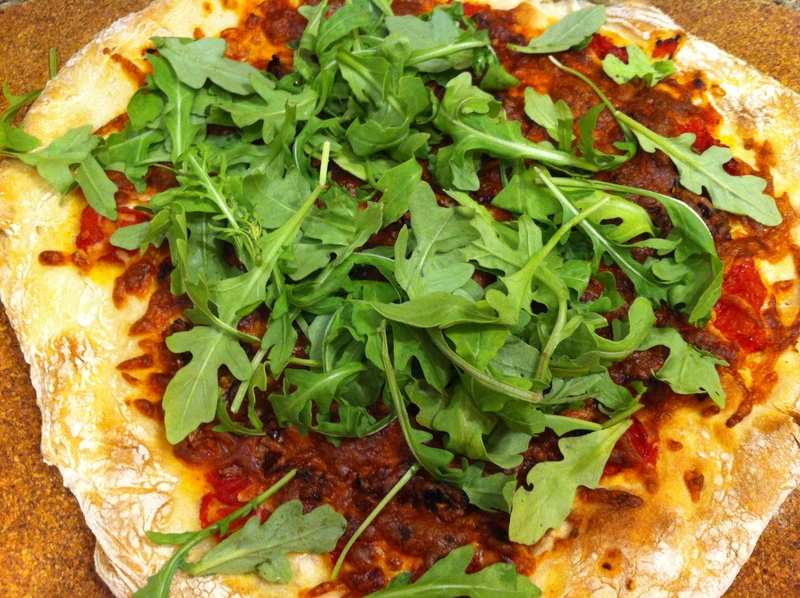 Pizza with caramelized onion and arugula. Dave and I got the idea of making our own pizza earlier this year, but it wasn’t until the magic of the wedding registry that we were fully equipped to do it (thank you Katie and Liz). Our first attempt was pretty meh. The crust was too thick and underbaked, and it stuck to the pizza peel, resulting in lots of panicked expressions as we struggled to shake it off and into the oven. Tonight, while trying to figure out what to do for dinner without Dave, I decided to make pizza. I had arugula, and I know I’ve liked arugula on pizza, but I can never remember what other toppings accompanied it. So I did a quick Google search and turned up this deliciousness. Since it’s been years since I caramelized an onion, I dug up this handy how-to, also from SeriousEats. I made the dough (Bittman’s recipe for Basic Pizza Dough, HTCE p. 258) and dashed off to the market while it rose. I can’t eat white sauce, so I decided to stick with red. Dave actually made a huge batch of red sauce, but I didn’t want to defrost it, and I also like a thicker, plainer sauce for pizza. Years ago, I made pizzas at home, and I used an awesomely easy tomato sauce recipe. It was like two ingredients. Needless to say, I have not been able to track it down, so I did Bittman’s Basic Tomato Sauce (HTCE p. 130), which turned out…fine. I did not crush the tomatoes enough with the fork and I overcooked the whole thing. The caramelized onions fared better, and I tossed in a bit of balsamic at the end, to help deglaze the pan and to add some flavor. The other main improvement was thoroughly flouring the pizza peel. I rubbed the flour into the peel to make sure the surface was nice and smooth. I drizzled the dough with olive oil, smeared it with sauce, put the caramelized onions on top, and then topped it with cheese, then put the whole thing in the oven. The extra flouring really helped the pizza slip right off the peel — even though I left it in the oven, with the pizza on it, as I ran to turn off the smoke alarm. I thought for sure the dough would start melting into the peel. It cooked a bit longer than the recommended 8-12 minutes (maybe closer to 15-18 to get the crust to brown a bit), and by that time, the cheese had browned. I put the arugula on it when it came out of the oven, hoping that it would wilt, but it didn’t. The flavors were good, though. Flattening the risen ball of dough into a disc, then letting it rest before rolling it out. The rolled out dough held its shape much better than when I’ve made pizza in the past. Thoroughly flouring the pizza peel. I actually rubbed the flour in, which smoothed out the surface nicely. The flavor combination. It was super tasty. A different sauce recipe. In writing this post, I actually found the recipe I used to use: crushed tomatoes, olive oil. Easy peasy. Waiting a few minutes to add the cheese. I have struggled to get the right balance between crusty crust and gooey cheese. Since today I know that I rolled the dough out thin enough to get a crusty crust, I think I need to let the pie cook a bit before I add the cheese. Add any greens I want wilted while the pizza is still in the oven. I didn’t want fully wilted greens, but I wanted slightly wilted greens. By adding them after the pie came out of the oven, I got un-wilted greens. Tested: Cooking the Perfect Pizza at Home This one is for the crazy DIYers out there. Pizzaquest A while back, my friends and I were trying to find the best pizza in San Francisco. We tried a few.